Yes, terrorism is horrific. Yes, Arafat is despicable. Yes, international relations is complex, rife with contradictions that seem necessary given the state of the world. But there comes a time when one must look at reality. There was a time when "good Germans" failed to see reality. There are undeniable truths. A large percentage of the Israeli public and American Jewry believe that Israel has biblically-based sovereignty over the West Bank, as part of the so-called "Land of Israel." Furthermore, few in America know that Sharon developed a policy of destroying the Oslo process before coming to power (before you scoff, research -- it's documented fact). Few in America understand that he has said that Israel has a right to all the land of the West Bank. Few in America (but some in Israel) understand that Arafat wasn't offered 90-plus percent of the occupied territories at Camp David in the summer of 2000. By the time the Taba accords in Jan. 2001 concluded, Barak's negotiators extended that level of offer with other issues unresolved, but Barak and Clinton were on the way out and the deal making died. Israel, the Palestinians and the US share the blame for the failed talks; it is a myth that only the Palestinians are to blame. And so it is that we see Israel today. The Sharon government has fostered a policy context and culture where the IDF plants the Israeli flag directly on the compound of the Palestinian Authority headquarters. Sharon's Israel is marking it's territory. Israel is in my heart. But Sharon's Israel is not our Israel. Sharon is anything but (as George W. Bush moronically proffered) "a man of peace." No amount of spin can refute the fact that the Sharon government has no desire for any form of negotiations or peace settlement. You may say that negotiations are impossible when terrorism is constant. There is a measure of truth in that analysis. But if you fail to study further, you are doomed to an incomplete understanding of what's going on. You are doomed to being a "good German." There are many in Israel (Sharon among them) that believe the West Bank must be colonized and ultimately annexed -- period, end of report. That is an ideological position rooted in religious fanaticism. It is as unacceptable as the religious ideological fanaticism that motivates some Palestinians to see suicide bombing as justified. God, may you bring strength to my fellow American Jews, for they will need it if they seek to understand how toxic Israeli political culture has become. RAMALLAH, West Bank (AP) - Israel planted its flag in Yasser Arafat's compound Saturday, and shell bursts shook his offices, chipping away at the building in an ever-tightening siege designed to make the Palestinian leader surrender militants or leave into exile. Soldiers with loudspeakers in the evening shouted to the estimated 200 people holed up in Arafat's offices to evacuate the building - the last one still standing in the compound - or else troops would blow up the building. Israel has insisted that it does not aim to harm Arafat even as it has torn his command center down around him over the past three days, and it appeared unlikely troops would carry out the threat. Earlier Saturday, Arafat appealed to Palestinian militants to halt attacks on Israel but refused to hand over 20 wanted members of his entourage. He spent the day making telephone calls and faxes from a conference room in the battered building, surrounded by shattered cars and barbed wire. An Israeli shell overnight destroyed a staircase in the building, trapping Arafat to four rooms on the second floor of the building. In the morning, several more shells struck the building, including one that hit the floor above and dusted Arafat with dirt and debris. 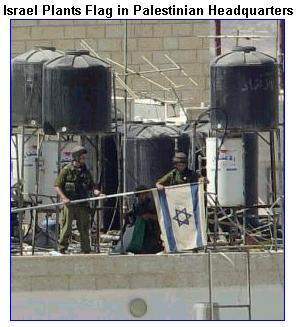 At one point, Israel troops raised a flag on a nearby building in the compound. When told of the flag, Arafat got up to take a look from a window, said Hani al-Hassan, a senior PLO official trapped inside. Israel, preparing for a long standoff, said it would not withdraw from the compound before the wanted men surrender - and left open the possibility that even then troops might not leave. Israeli officials have told the Palestinians the assault, which was launched after a Tel Aviv suicide attack last week, seeks to isolate Arafat. But Israeli television cited defense officials saying the assault aims to make conditions so unbearable that the Palestinian leader leaves into exile. The United States and the European Union have urged Israel to show restraint and have been trying to defuse the crisis - amid fears in Washington that a flareup between Israel and the Palestinians could complicate its campaign against Iraq. France demanded Saturday that Israel halt the operation, saying it was unacceptable. The European Union's foreign policy coordinator, Javier Solana, said the raid would not end terrorism but would undermine efforts to reform the Palestinian Authority and work out a truce. Arafat has been under Israeli siege before - including 34 days in spring when he was confined in the same office building, as well as a 1982 siege in Beirut. But he never seemed weaker. Many Palestinians have been demanding that he share power, the United States seeks to sideline him and Israel's prime minister reportedly wants to expel him, held back only by warnings from Israeli security chiefs that such a step could backfire. On Saturday, bulldozers dug a deep trench and troops ran coils of barbed wire around the main office building. The smaller wing of the large L-shaped structure - the only building still standing - was heavily damaged. A massive D-9 bulldozer - about the size of a small house - belched smoke as it shoveled debris. Diesel fumes from tank exhaust and dust filled Arafat's office. Five explosions rocked the compound Saturday, and aides said there was concern Arafat's building might collapse. A picture taken by his personal photographer and released Saturday showed a grim-faced Arafat wearing thick, black-rimmed glasses, poring over papers at his desk, with several aides at his side. Beside him was a holstered pistol with belt, next to a desk calculator, a box of tissues and two bottles of mineral water. Those trapped with him said Israeli troops demolished water pipes, the main kitchen and the pantry, but that there was enough water from rooftop tanks and stored food to last a few days. Palestinian officials said Israel's demand for the surrender of wanted men, including West Bank intelligence chief Tawfik Tirawi, was just a pretext, and that Sharon's real objective is to humiliate Arafat. "Sharon is implementing his plan of destroying the Palestinian Authority and the peace process, harming President Arafat and resuming the occupation," said Palestinian Cabinet Minister Saeb Erekat. Raanan Gissin, a Sharon adviser, left open the possibility that troops would stay on even if the wanted men surrender. "First of all, we want those people in our hands," he said. "Then we will consider what action, what further action we will have to take in order to ensure and defend our citizens." Five Israelis and a Scottish seminary student were killed in Thursday's suicide bombing on a Tel Aviv bus, claimed by the Islamic militant Hamas group. In a statement published by the Palestinian news agency Wafa, Arafat again called on militants to halt attacks inside Israel. He did not directly address the surrender of the wanted men, though his aides have said they would not be turned over. "We are ready for peace, not for capitulation," he said in the statement, his first comment since the Israeli raid began. Arieh Mekel, an Israeli Foreign Ministry official, dismissed Arafat's appeal to the militants. "We don't care what Arafat says, one way or the other," he said. Israel initially called for the surrender of 19 Palestinian officials, including members of the intelligence service and Arafat's Force 17 bodyguard unit. It detailed allegations against four of them, but never released a complete list. On Saturday, a senior army officer taking reporters on a tour of Arafat's compound said Israel wanted 50 men to give themselves up. Army officials said the figure increased because Israel initially did not have a complete picture of who is inside. Two senior Palestinians who have been in contact with Israeli officials said Israel never formally demanded the surrender. However, a third official, speaking on condition of anonymity, said the issue was raised by Sharon in a phone call. The U.N. Security Council was to meet Monday to discuss the siege. Erekat said the Palestinians are dismayed the debate will not be sooner. "Things cannot wait until Monday. We want an immediate decision from the council," he said.